That’s why I love road trips, dude. It’s like doing something without actually doing anything. Monday, April 10, 2017: Leaving Oasis RV Park in Las Vegas with these two chuckleheads in tow. The morning is sunny and clear with temperatures near 70 degrees which makes it a great day for a road trip. 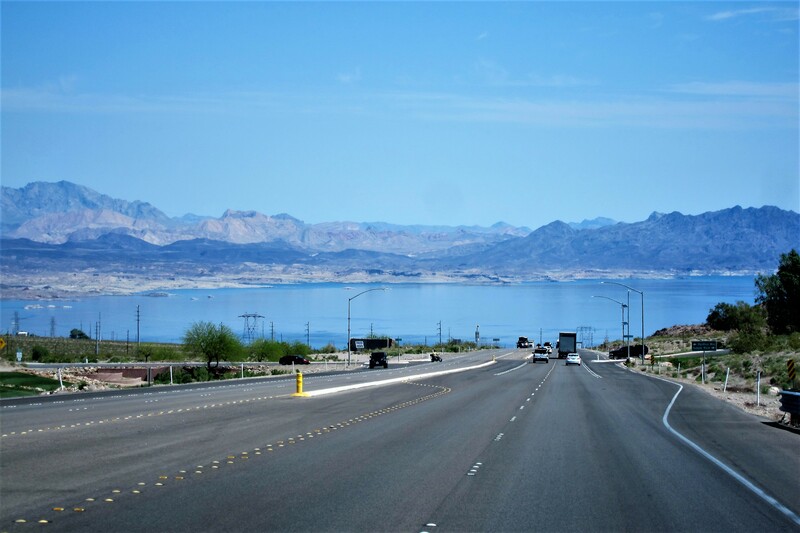 Heading south, we passed through Boulder City and down into the valley of the Colorado River and its impoundment, Lake Mead. Due to the recent rains, the lake is much higher than in the past, and the snows in the mountains haven’t begun to melt yet! 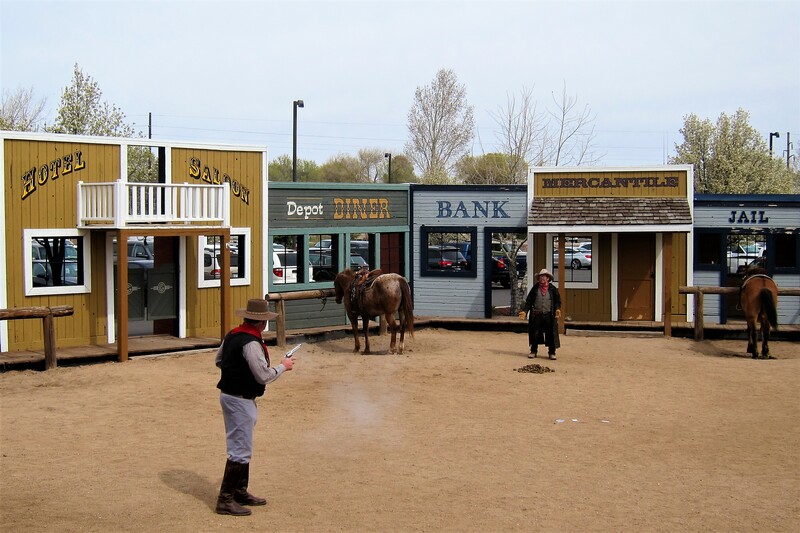 A successful road trip requires entertainment along the way, and plenty of rest stops for food, drink, and exercise. 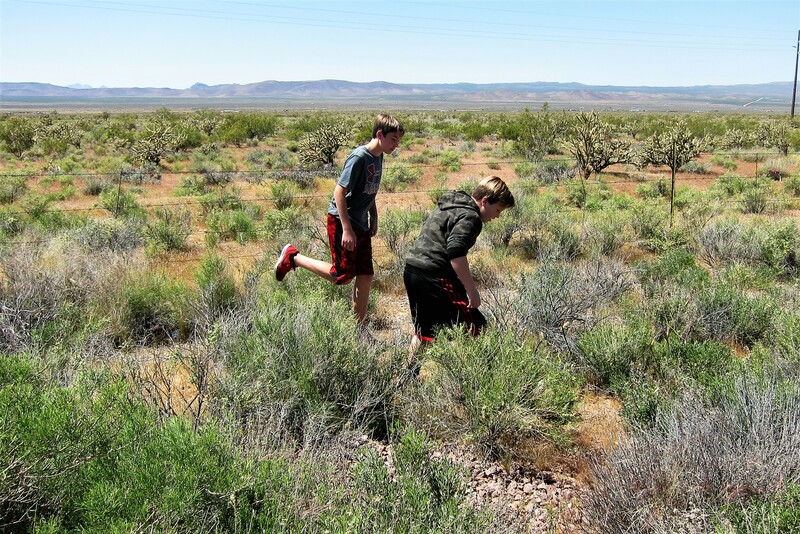 Where the boys can release some energy by running amuck in the vast desert. The reason for the barbed wire is to keep pre-teen boys away from the free-range cattle. This is a surprise road trip so neither Jack of Tucker know where we are headed. However, Jack took that as a challenge. Paying attention to our direction and asking a few questions he deduced that we were heading to Arizona…and he was correct! Doesn’t look like Arizona? 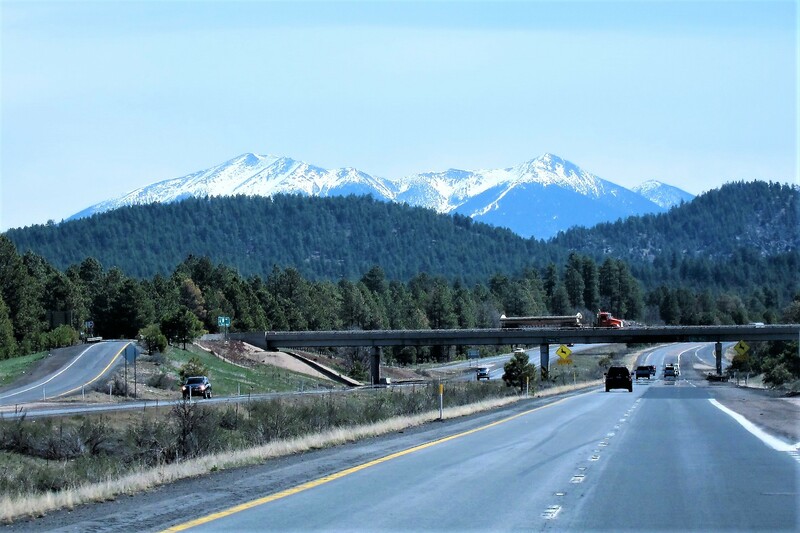 Well, that’s because this is one of the most ecologically diverse states in the union and we are in high desert country heading toward the mountains! 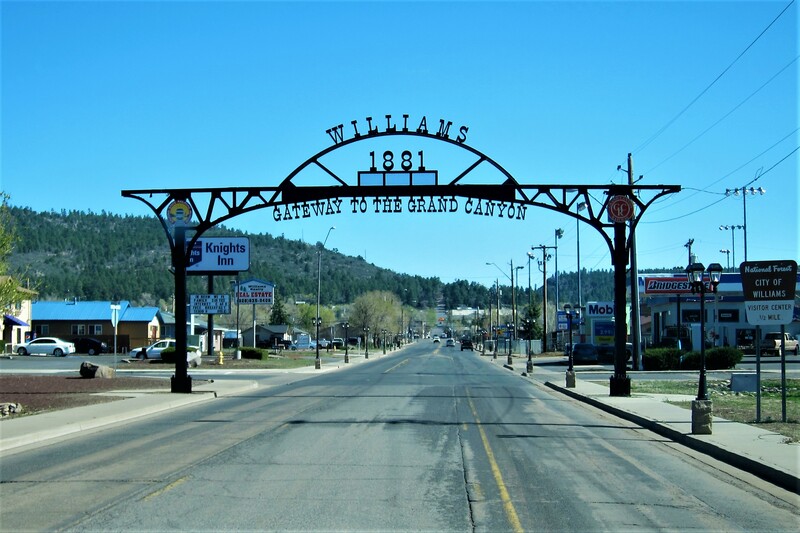 An hour to the east brought us to our first destination…Williams, Arizona. 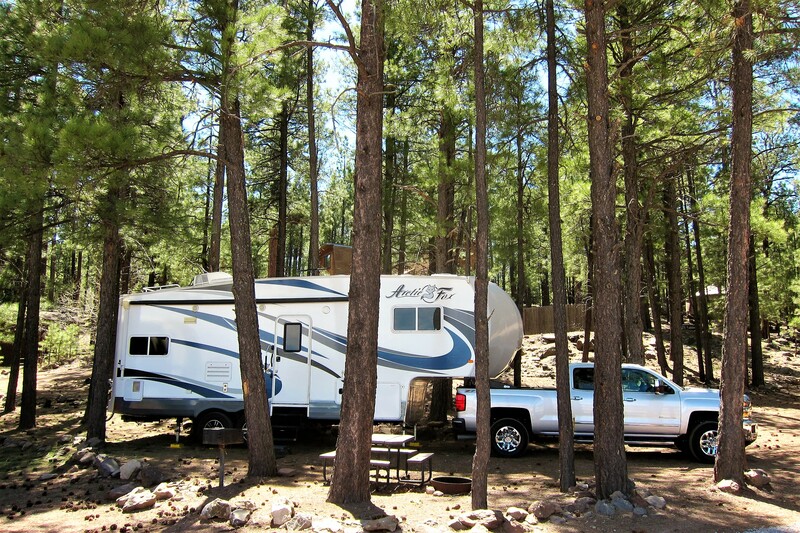 Where we set up camp at the Grand Canyon Railway RV Park. 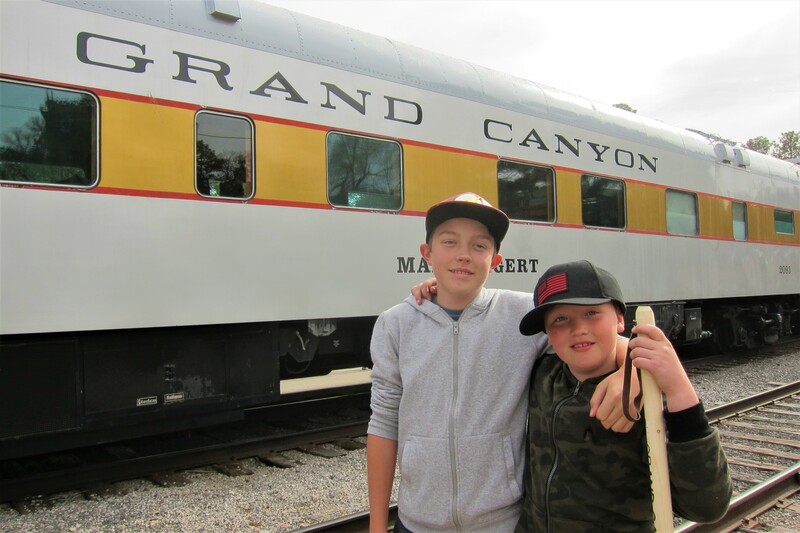 Tomorrow, the train to The Grand Canyon and the boys are some excited! 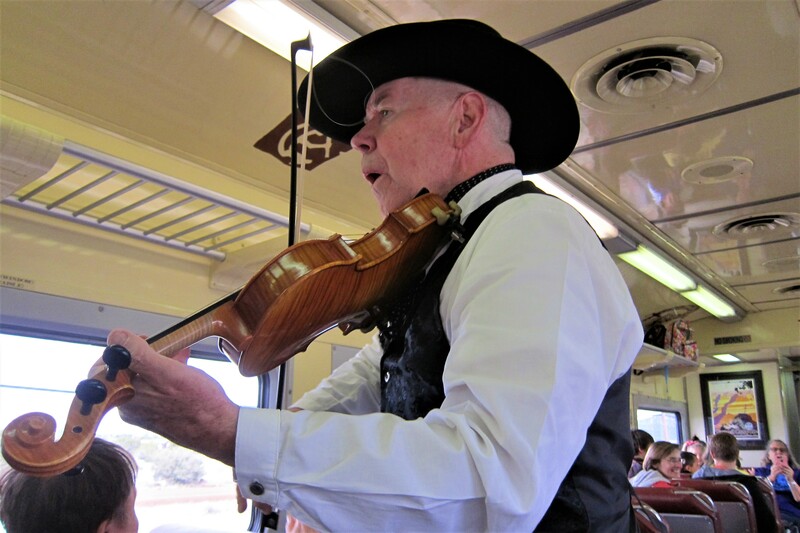 Tuesday, April 11 and Wednesday, April 12, 2017-Williams, Arizona: Up early to catch the train to the South Rim…but first we enjoyed an introduction to western culture. 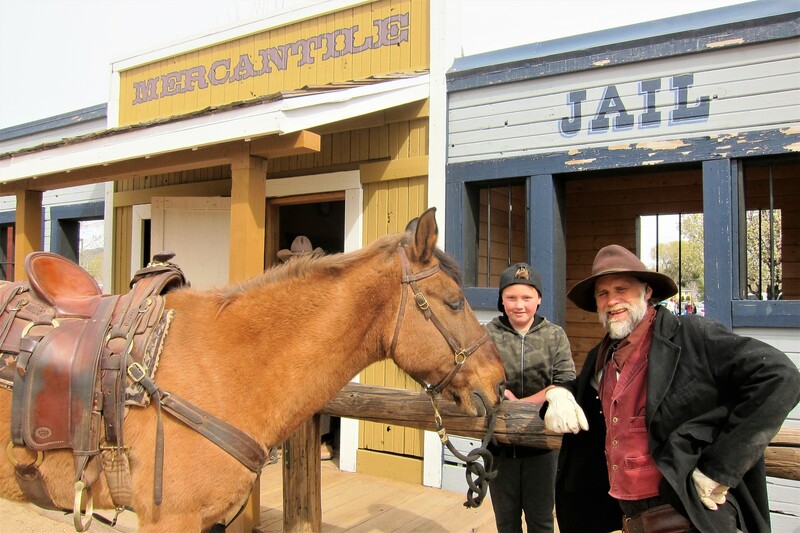 Where we interrupted an “encounter” between some outlaws. And, as the song goes…the law won! 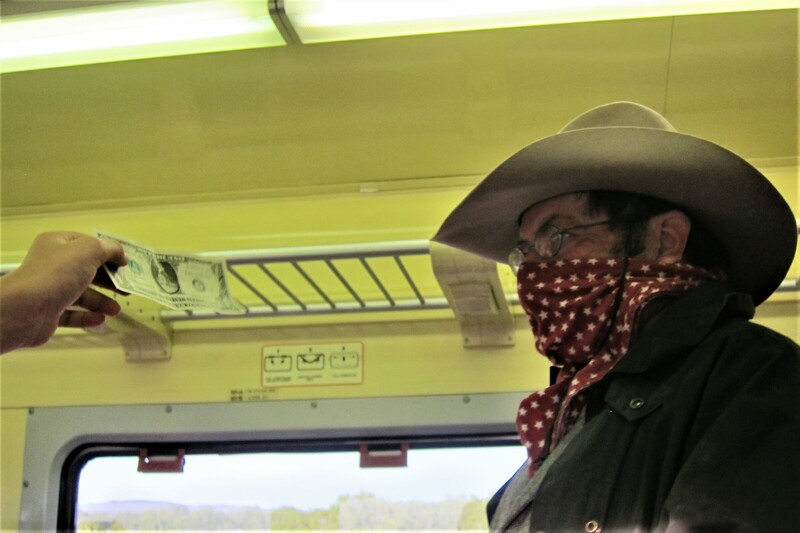 Next it was time to board the train to Grand Canyon National Park. 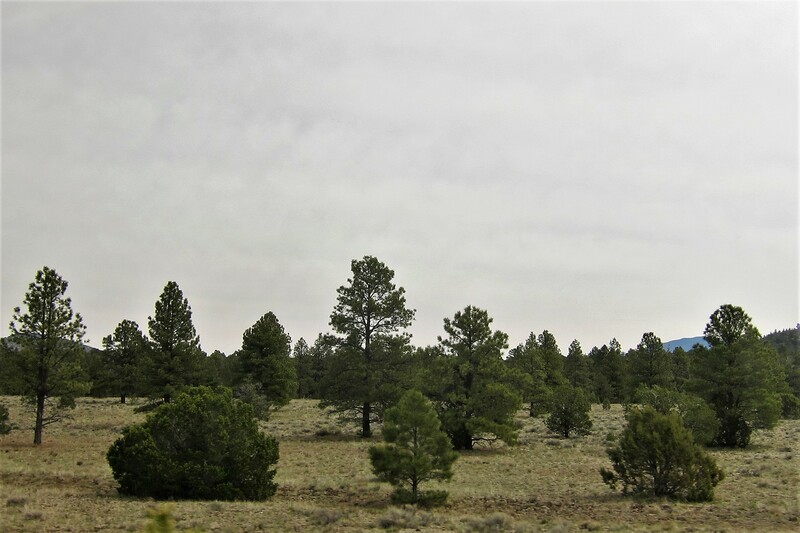 The trainway was developed from an old ore mining track by The Santa Fe Railroad in the early 1900’s. 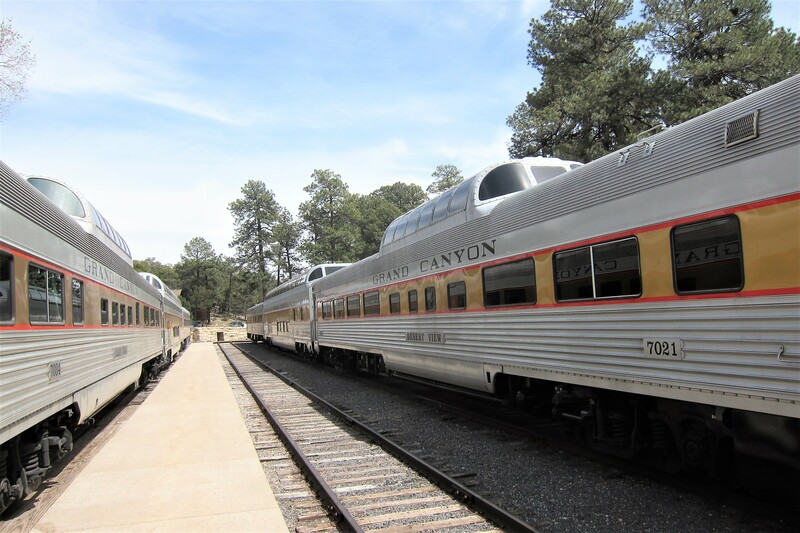 It was the primary vehicle (no pun intended) to bring folks to the railroads hotels and tourist camps at the new Grand Canyon National Monument, recently protected under the Antiquities Act by President Theodore Roosevelt. An agreement was worked out by the boys as to who would sit with whom during the trip. Tucker has a window seat with Gumbo. And Jack got stuck with me. Then on the return trip, the boys agreed to swap…pretty diplomatic as well as a great compromise. 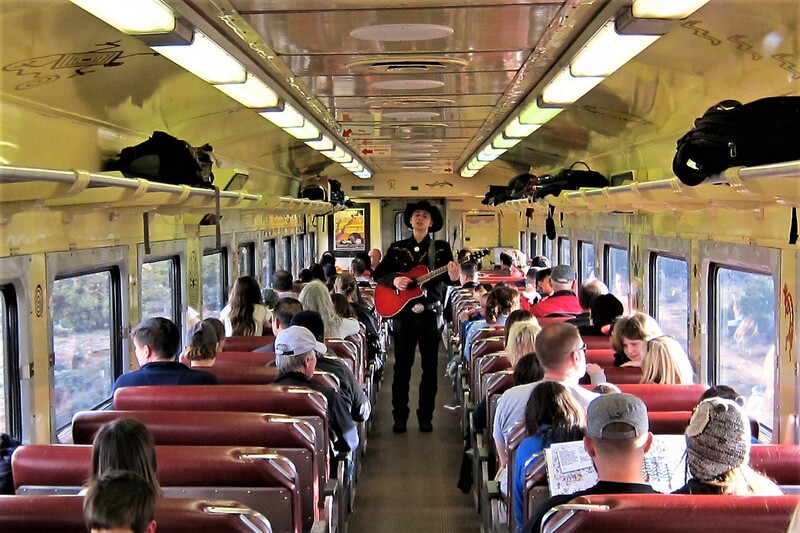 During the two-hour trip, there were a series of musicians that came through the coach to entertain the passengers. While the high desert countryside rolled by. 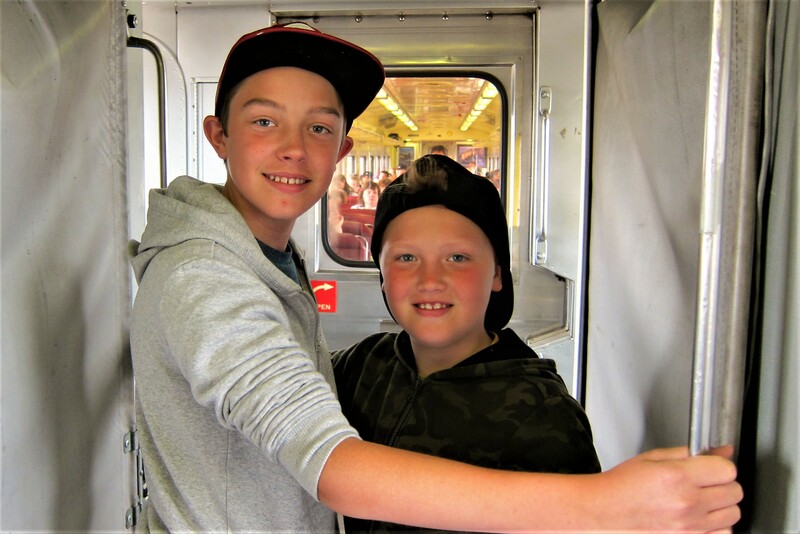 Many trips to the diner car, resulted in the boys discovering they could straddle the coupling between cars and feel the sensation of the two coaches moving over the rails independently. Arriving at Grand Canyon National Park train station, we made our way up the hill toward the rim. Allowing Jack and Tucker to lead the way was strategic, as we knew the “oh wow” factor of seeing the canyon for the first time. And…as if on que, upon initially viewing the grandeur, both boys gasped and emitted the waited for “oh wow”! They both divulged that this was their first National Park, but it wouldn’t be the last! Glad we could be a part of it!! 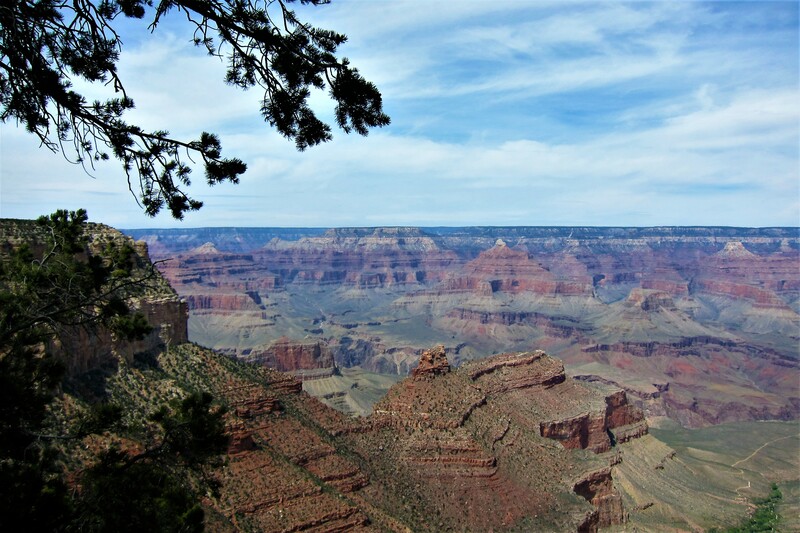 We walked the rim trail toward the west and stopped for lunch at Bright Angel Lodge. 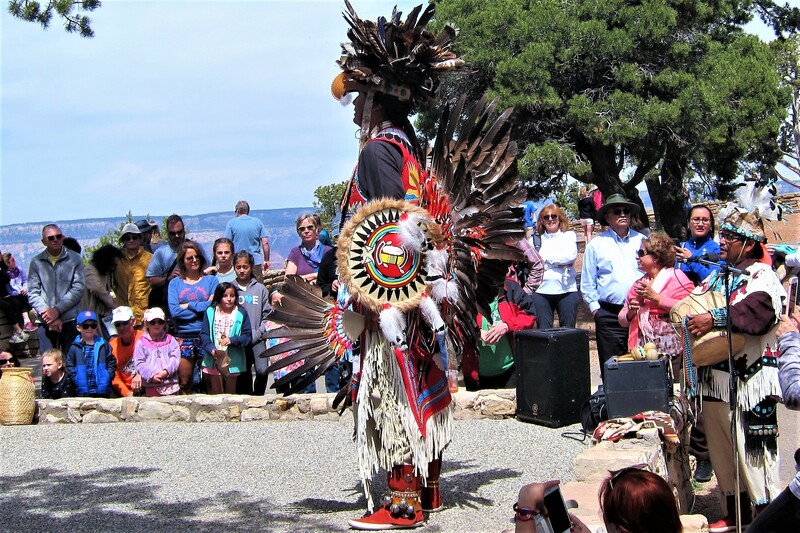 Then it was back east along the trail where some Navajo Indians were holding court. 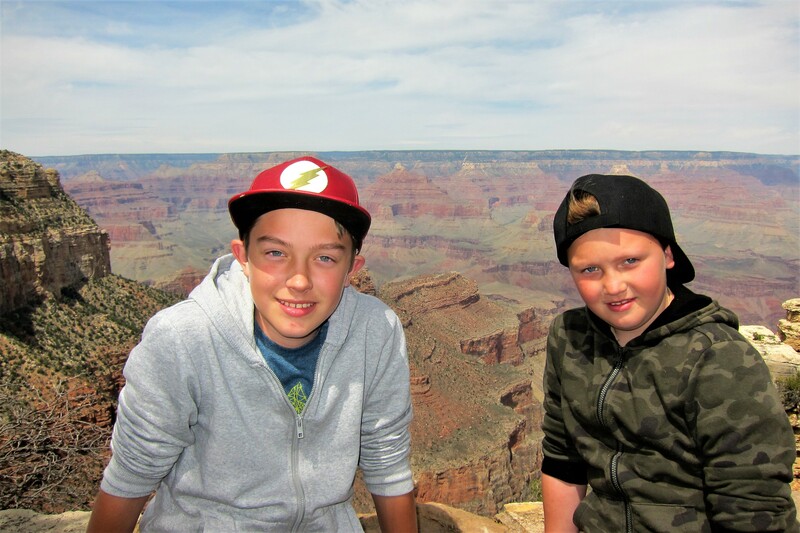 Then some more gawking at the magnificent Grand Canyon! Walking to the train station, we spotted this unique camper. 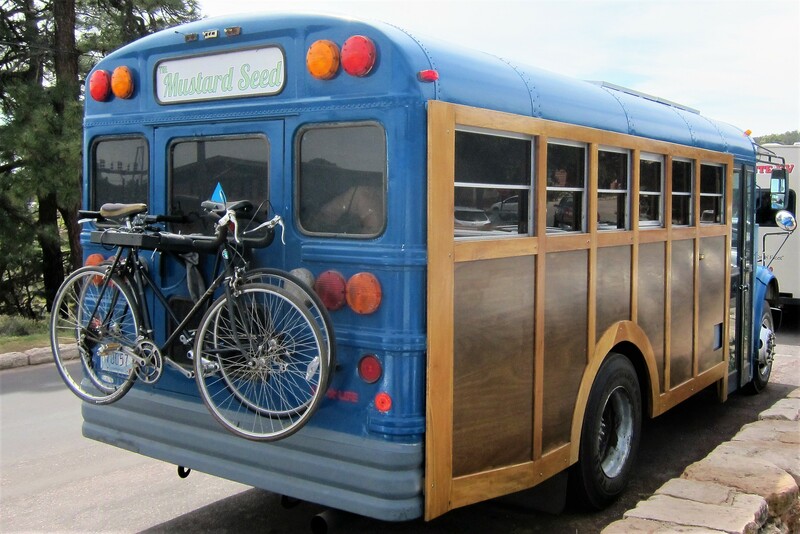 Kit and I have seen a number of bus conversions on the road…but never a Woodie! 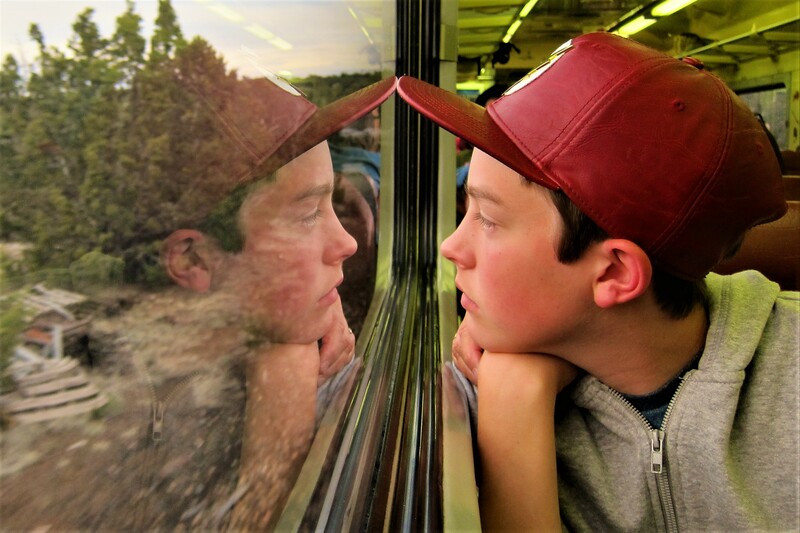 Back on the train, Jack who usually has his head buried in his iPad, was lost in quiet reverie as the train rolled along. 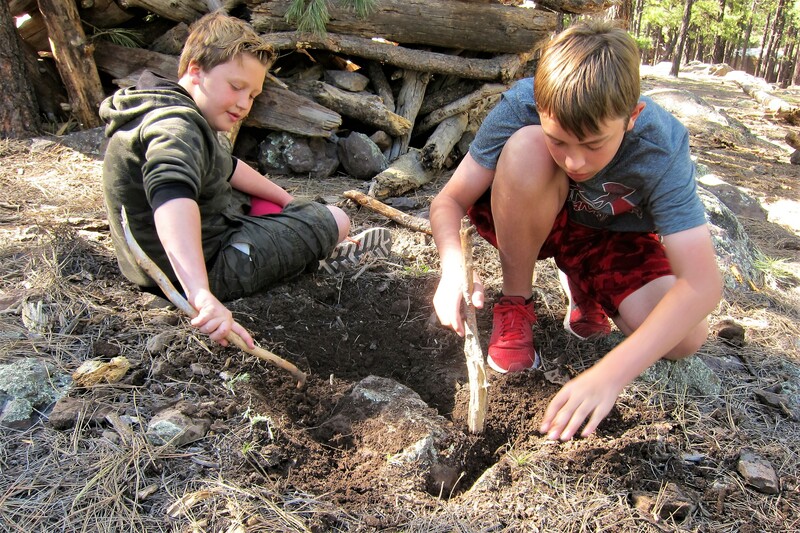 We firmly believe that exposing children to Americas natural wonders in the various units of the National Park System will create lifelong conservationists, and adults that will protect funding for these beautiful places. The trip back to Williams had musical entertainment as well. And those dastardly outlaws reappeared! This time to hold up the passengers! 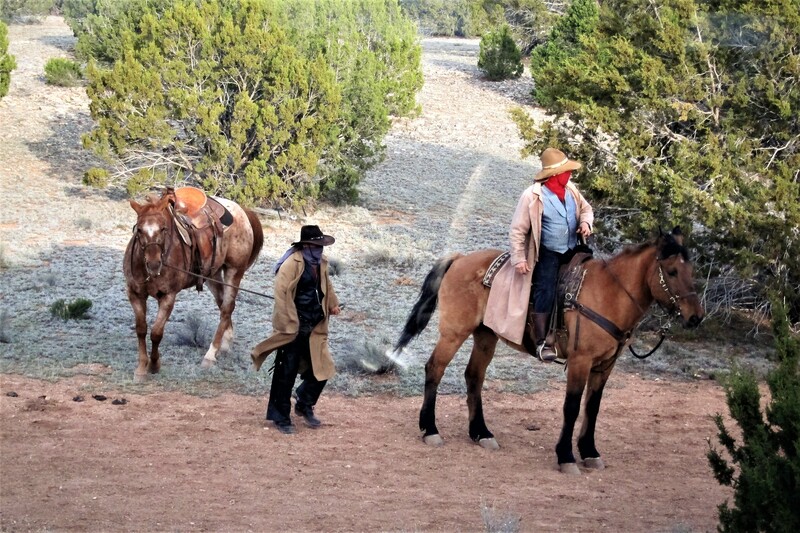 It should be noted that these outlaws have a warm heart as all their ill-gotten booty went to charity. A great day was had by all at one of America’s great National Parks! 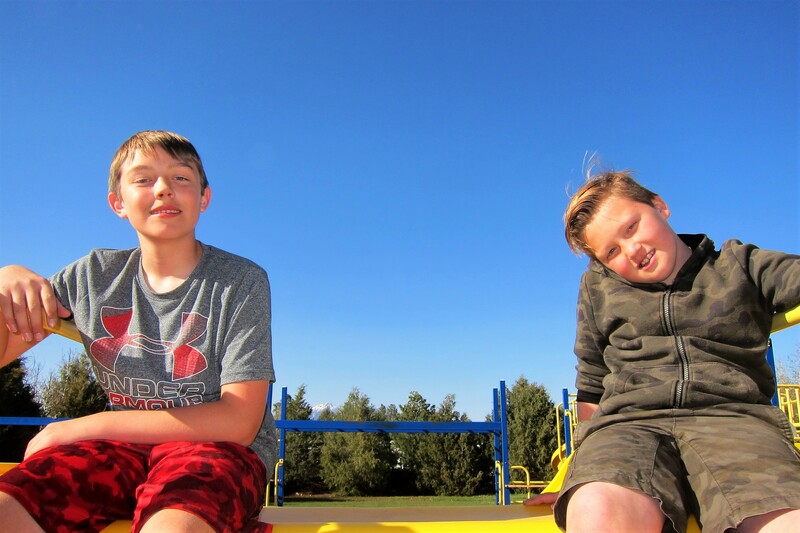 Thanks Jack and Tucker for sharing the day with us! 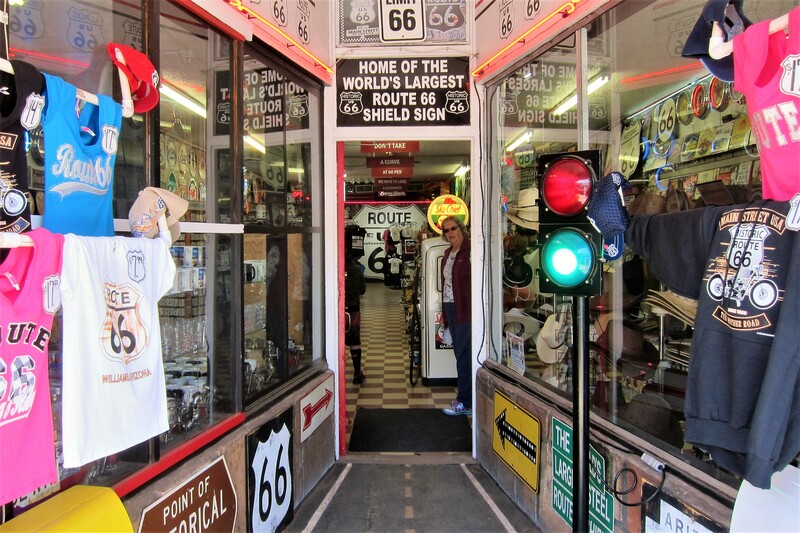 We also spent some time touring the frontier town of Williams, which being on Historic Route 66, had its fair share of gift shops. 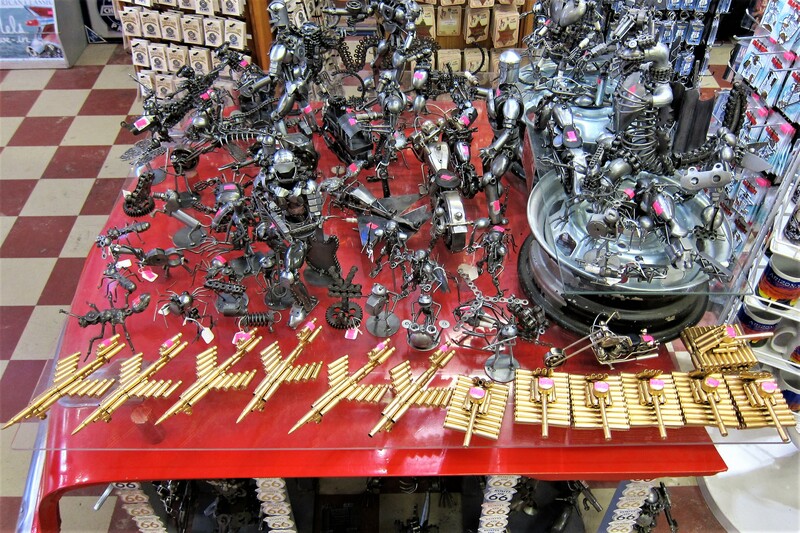 This particular place features many sculptures and other items made from castoff junk and expended brass. 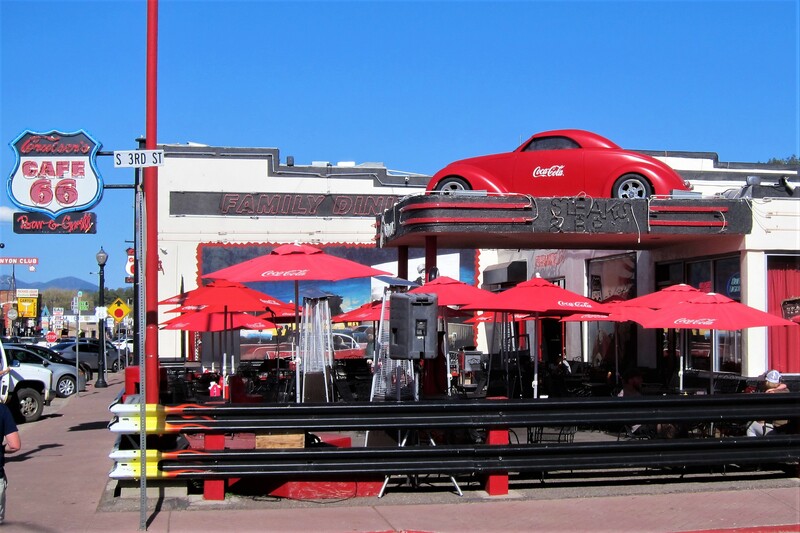 As we walked down the street, music from the early years of rock was heard emitting from Cruisers Café. 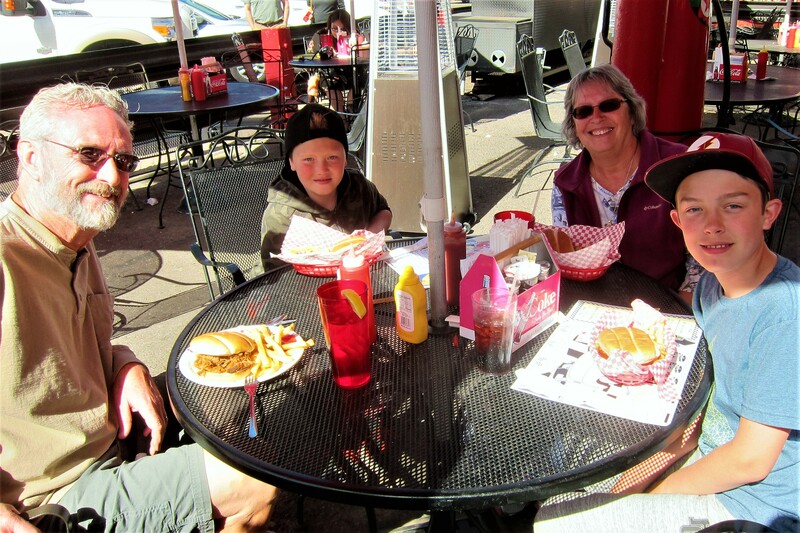 Which lured us in for some great barbeque. While John kept us entertained with many classic tunes. Tomorrow we are off to the next stop on Jack and Tuckers Spring Break Adventure! Thursday, April 13, 2017: Woke to sunny skies and temperatures in the low 60’s. 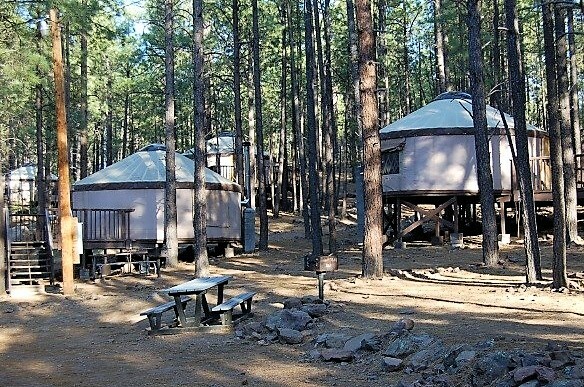 Broke camp then headed east on Route 66, until we came to I-40 which we traveled on toward the town of Flagstaff. That’s 12,633-foot Mount Humphries in the photo above…it usually has snow until late spring, and sometimes even longer. Heading south a short distance from town found us at Fort Tuthill, a US Military Recreation Facility located in the foothills of the San Francisco Mountains. 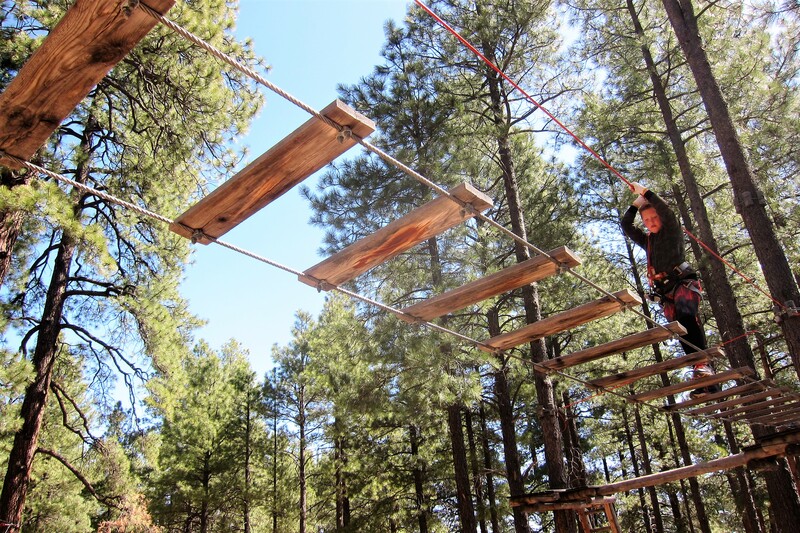 Unlike campgrounds found on most military installations, these recreation facilities are for the troops and their families to get away for, well…recreation. In this case, 140 miles away from its sponsoring installation of Luke Air Force Base outside Phoenix. 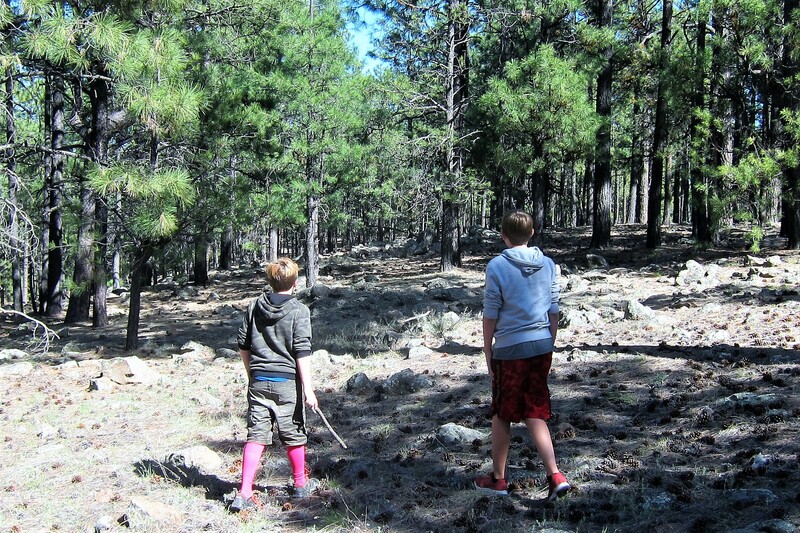 Located in the Coconino Forest, the area contains the largest stand of Ponderosa Pine in the world, so the boys found plenty of room to explore. 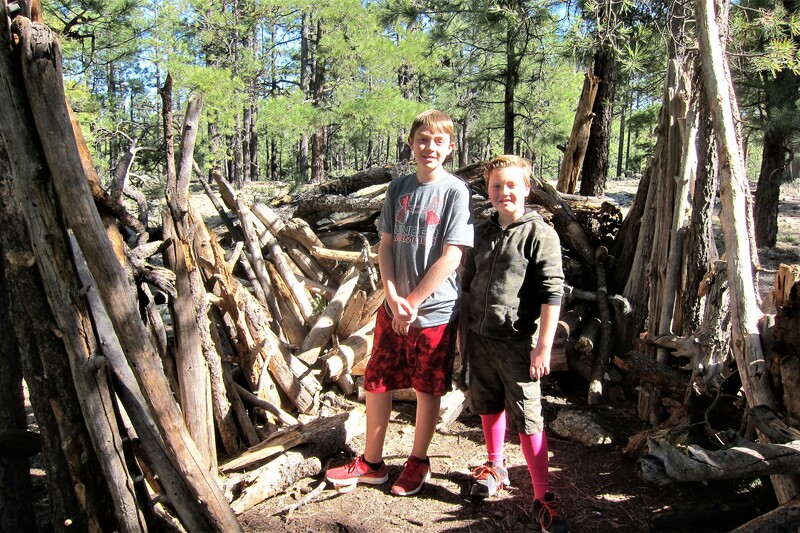 On one of their hikes, Jack and Tucker discovered a “debris hut” that someone had meticulously created. Evidence showed that this rather large structure made of branches, twigs and pine boughs had a substantial roof and was relatively weathertight. Unfortunately, the ravages of the severe winters and/or human vandalism has caused the hut to deteriorate. Nowadays, the only inhabitants are forest creatures such as this fellow scurrying about the branches and twigs. 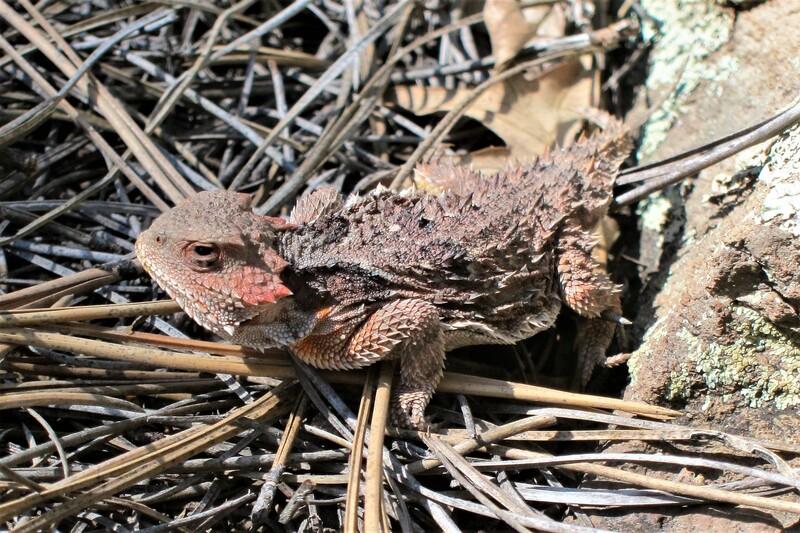 That folks, is a Horned Toad similar to the species I used to capture for pets as a youngster…and chase the neighborhood girls with. So, what do two city boys do when in the forest? Why dig in the dirt of course! They both fashioned primitive tools and used basic physics to try and unearth a rather large boulder. A great effort, but that was one huge boulder! 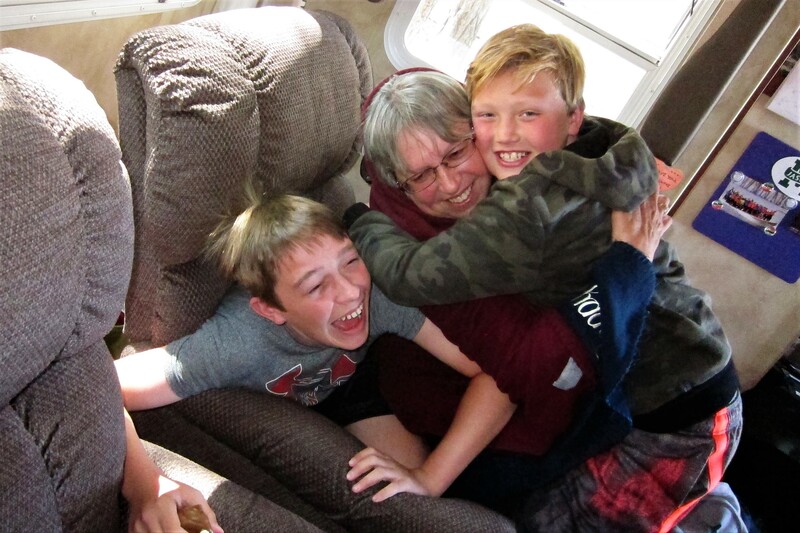 Back at the camper, and following dinner, it was time for a game called “Pile on Gumbo! 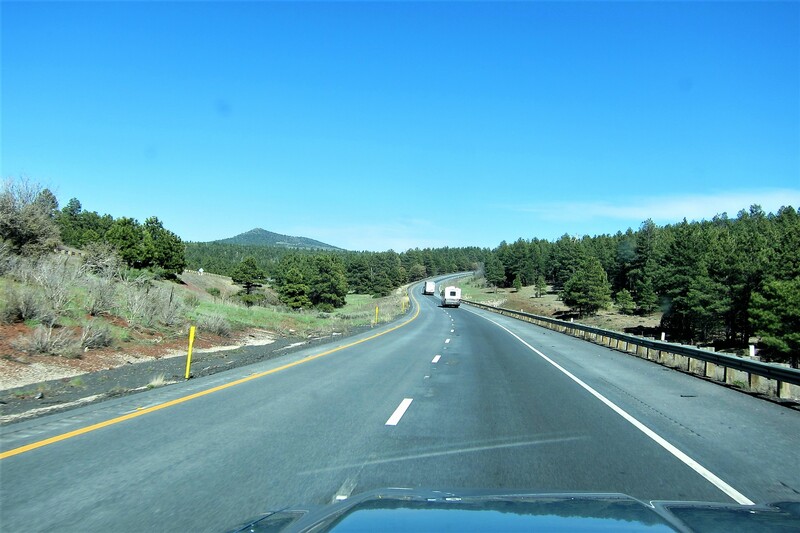 Friday, April 14, 2017-Flagstaff, Arizona: Woke early to sunny but cool weather with temperatures in the 50’s. 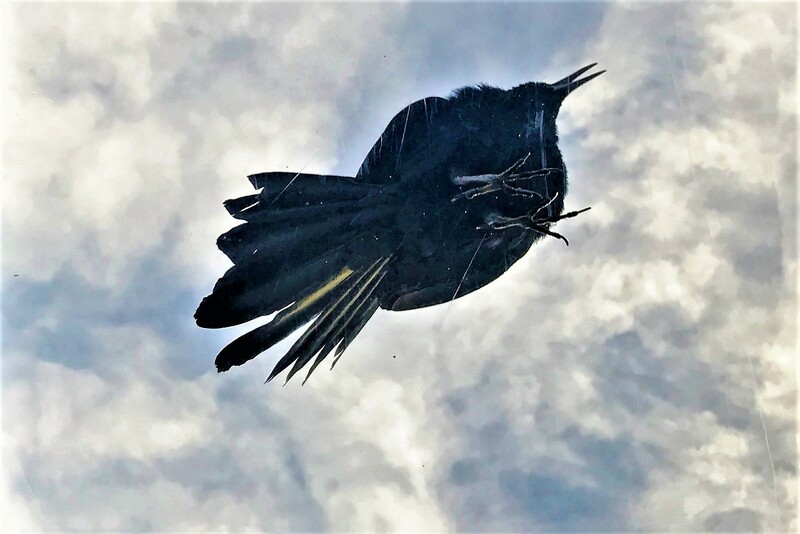 “While I nodded, nearly napping, suddenly there came a tapping”… Yep, while lying in bed enjoying the cloud formations viewed through the skylight and waiting for the boys to begin stirring about, this visitor appeared. Being an inventive soul I decided to name him/her, Nevermore! Which was appropriate as he/she never appeared again during our stay. If it hadn’t been for my iPhone nearby I would not have photographic evidence and the family would think I’m crazier than I actually am. 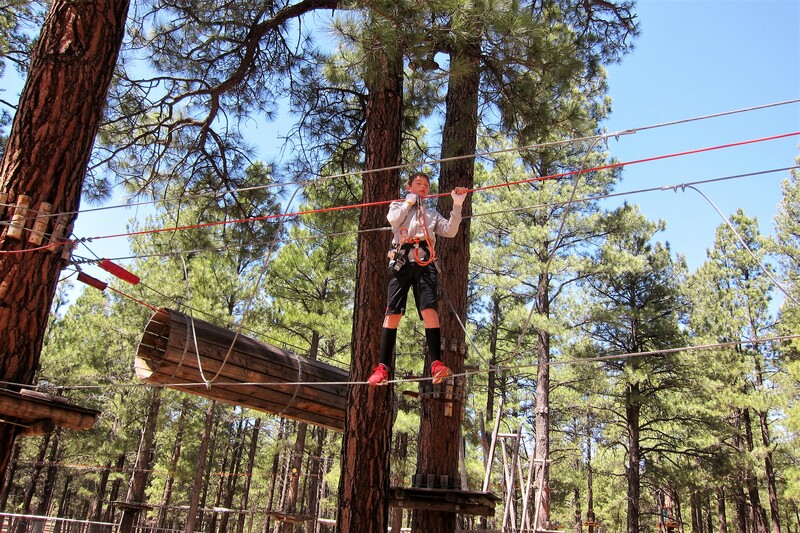 There are many reasons Kit and I decided to bring the boys to this part of Northern Arizona…cool crisp mountain air in a pine forest surrounded by lofty peaks, and one of the premier Ropes Courses in the country! 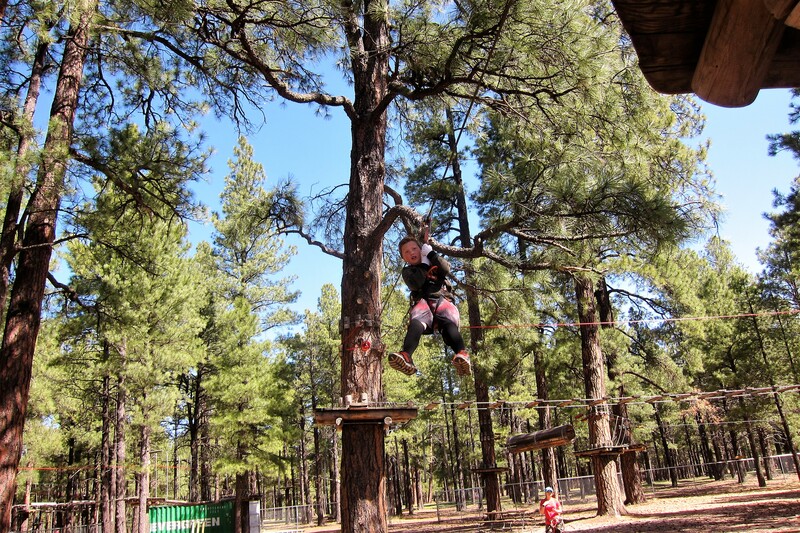 Within walking distance of the campground lies a tree-top adventure course known as Flag-X which features a series of challenging sections one must negotiate to move along the course. Able to proceed independently at your own speed, and having the opportunity to descend to ground level when desired, makes this course suitable for most every ability. 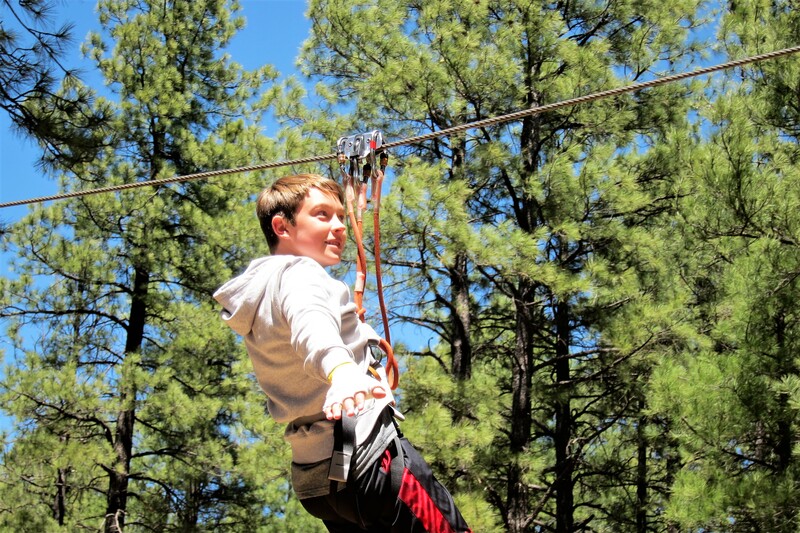 After signing the waiver forms, the next step is to harness up with two opposing safety lines then test out the safety gear on a low-level rope…actually, a steel cable. Both boys aced the first course, then it was off to the next one. A bit higher, and more challenging, Jack made short work of this course as well…doing the route three times, and with each lap he gained more confidence. Tucker, however had a bit of difficulty with this more difficult course. A Flag-X staff person climbed up into the trees and spent a great deal of time working with him which gained his success in a few more of the sections. 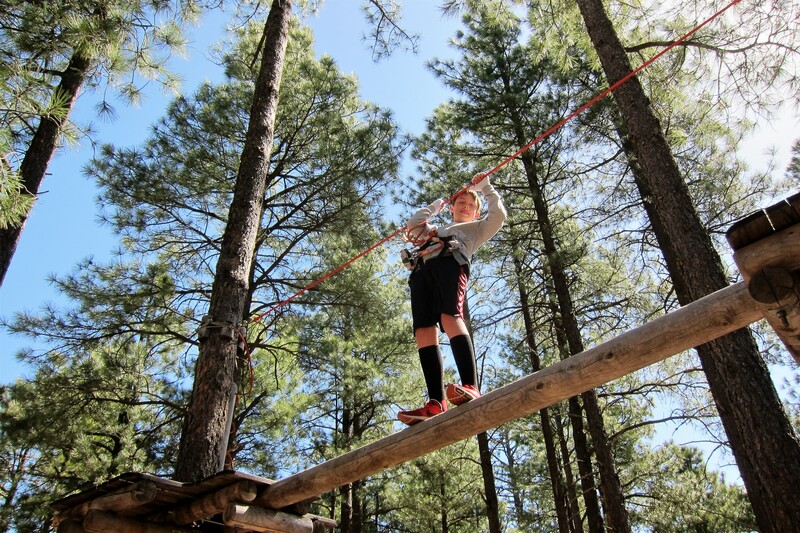 But at the swinging log bridge, he couldn’t quite make it across…maybe next year! 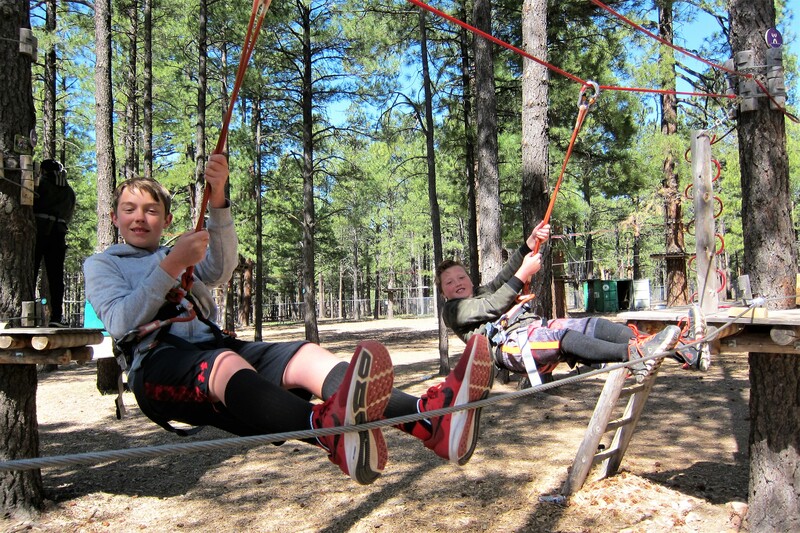 Jack on the other hand was all smiles as he zipped the final section. 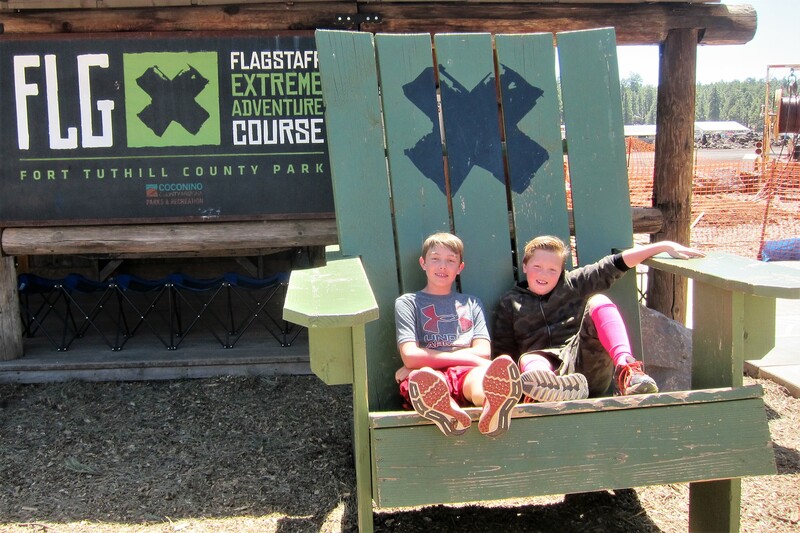 Both boys were happy and tired at the end of the day and agreed a return trip to Flag-X was in their future! Saturday, April 15, 2017: Today we head back into the city of Las Vegas. 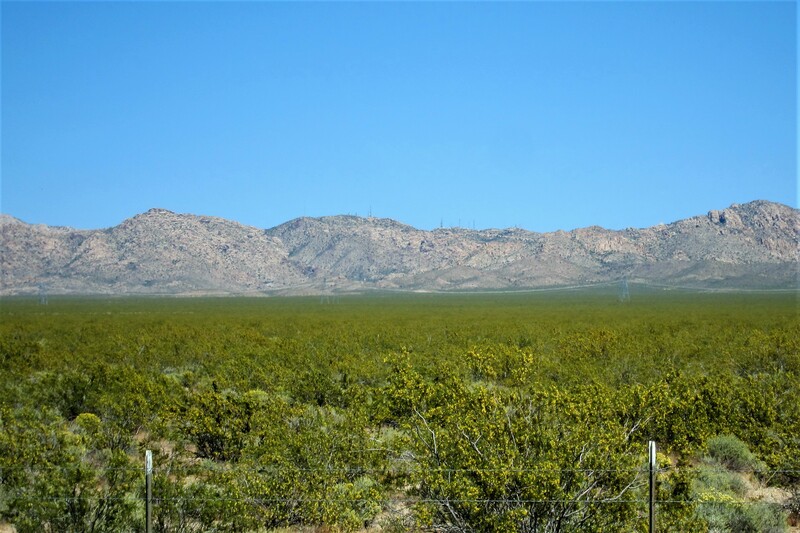 Deciding to take a different route home, we headed for Laughlin, Nevada and then northerly on US-95 paralleling the west shore of the Colorado River. And, no surprise, windflowers were carpeting the desert here as well! Along the way, the boys discovered our antique music playlist on my iPad and started rocking out to classics from The Rolling Stones, Chuck Berry, Fleetwood Mac, The Beatles, Beach Boys, and others. 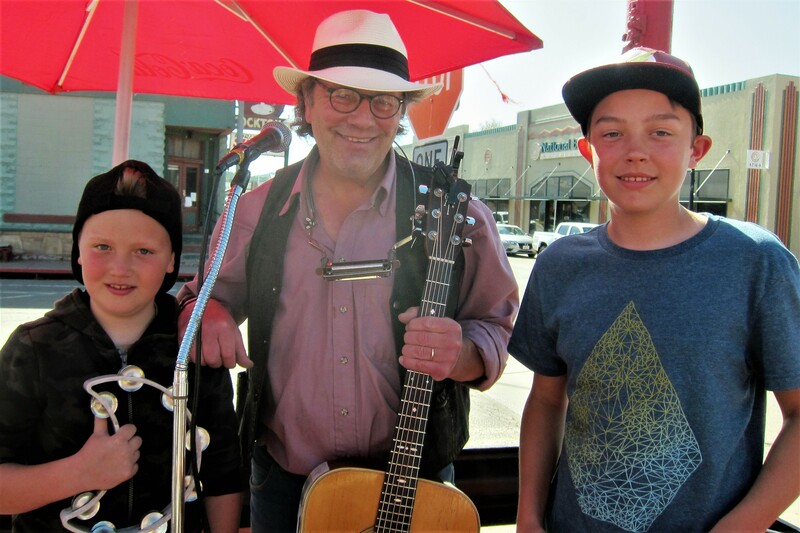 Kit and I enjoyed the tunes and the boys received an education in great music…a win-win! 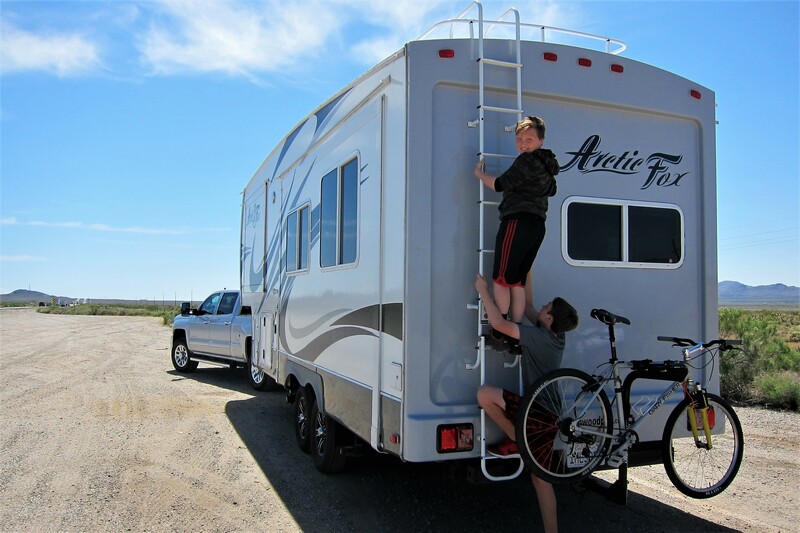 Back in town, we backed the camper into the kid’s driveway to unload gear. Since it was Easter eve, and the nonbelieving boys were sure they would wake to plastic eggs full of money, both Jack and Tucker wanted to stay in their home this evening. So, Kit and I headed over to Oasis RV, enjoyed a nice meal and a few cocktails before dropping off to sleep. Sunday, April 16, 2017-Las Vegas, Nevada: Woke to really nice spring weather. 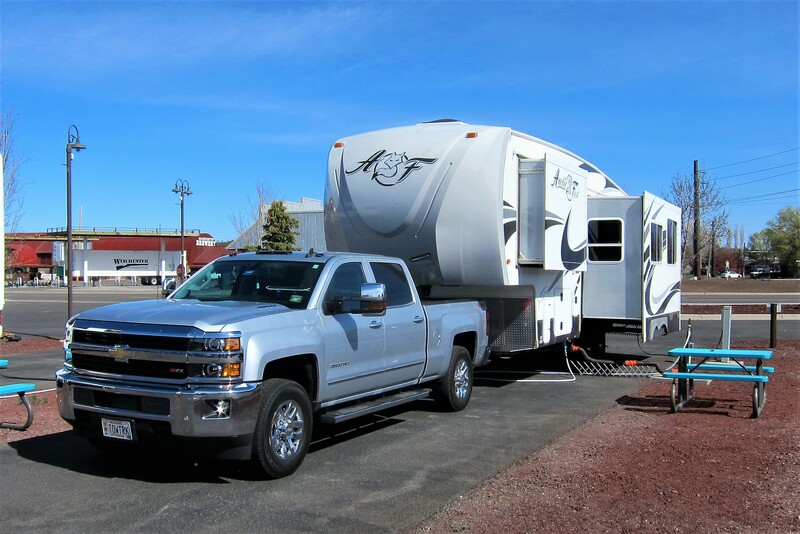 Suzie has invited us over for a traditional Easter backyard barbeque this afternoon, so we spent the morning relaxing about the RV park. 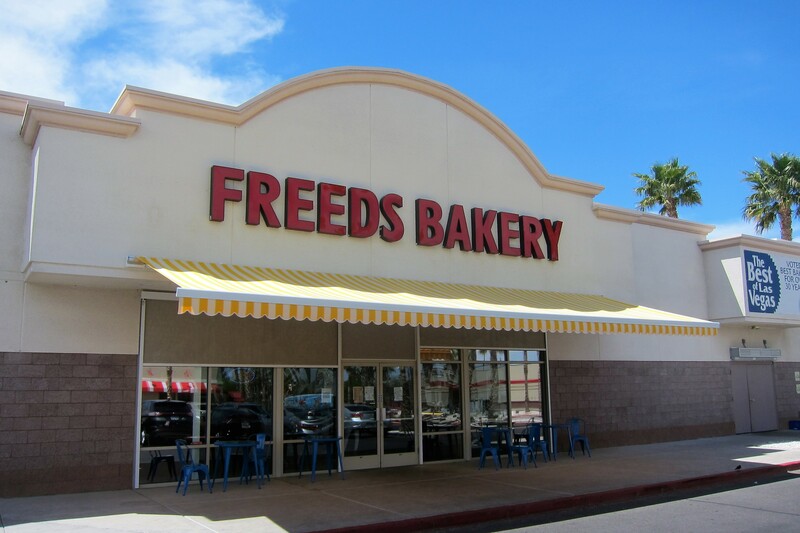 Our contribution to the meal was goodies from Freed’s Bakery…a Vegas institution, where we stopped on the way over. This place is consistently packed with drooling patrons. 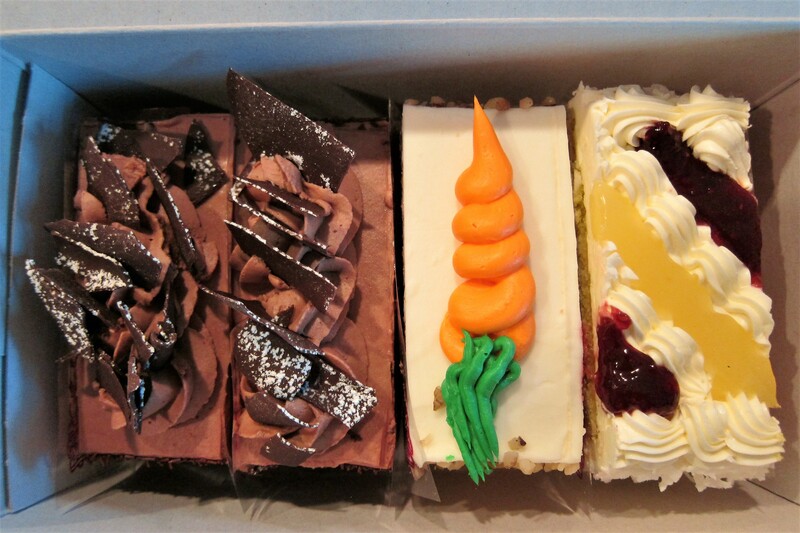 We selected four large pieces of cake…Chocolate Parisian, Lemon Chiffon, and Carrot Cake. 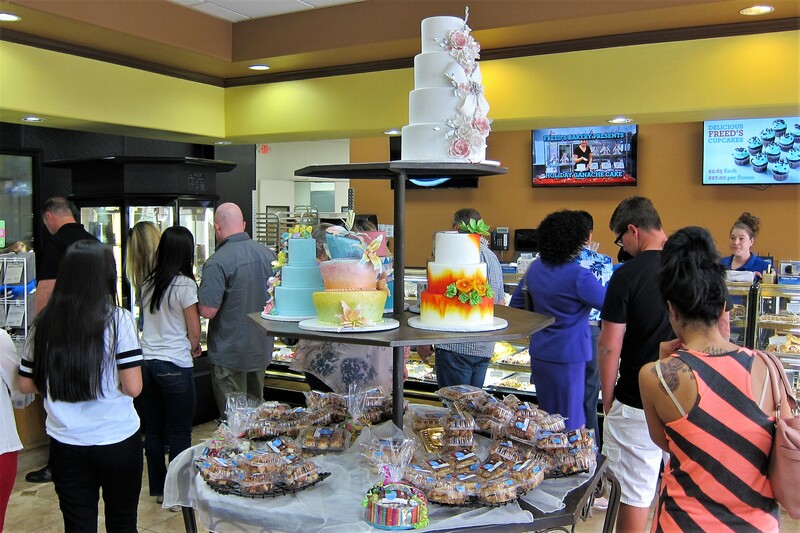 Hey, don’t be judgmental…the chocolate deliciousness is balanced out by the fruit and vegetable offering! 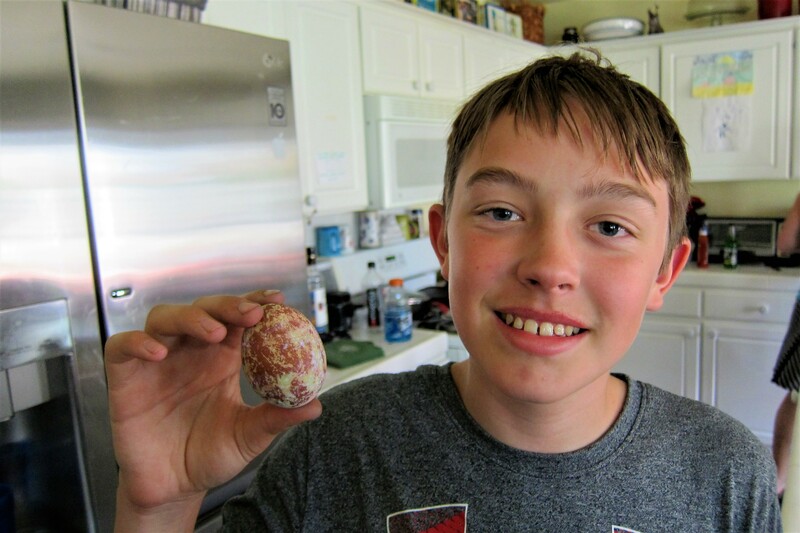 We also enjoyed grilled meat, broccoli salad, and deviled eggs made from the boys Easter handiwork. After the meal, there were a few rounds of full contact ping-pong which provided a lot of entertainment. 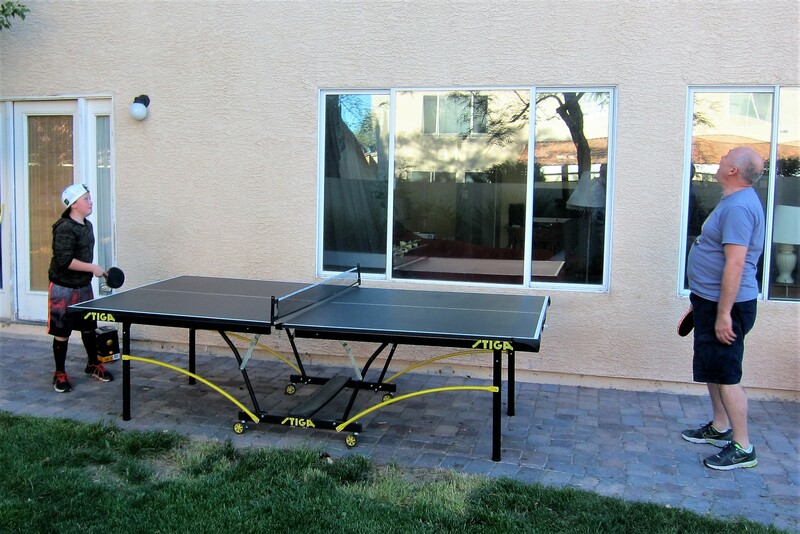 New rules were developed that allowed caroming off the side of the house, and multiple do-overs of the serve. 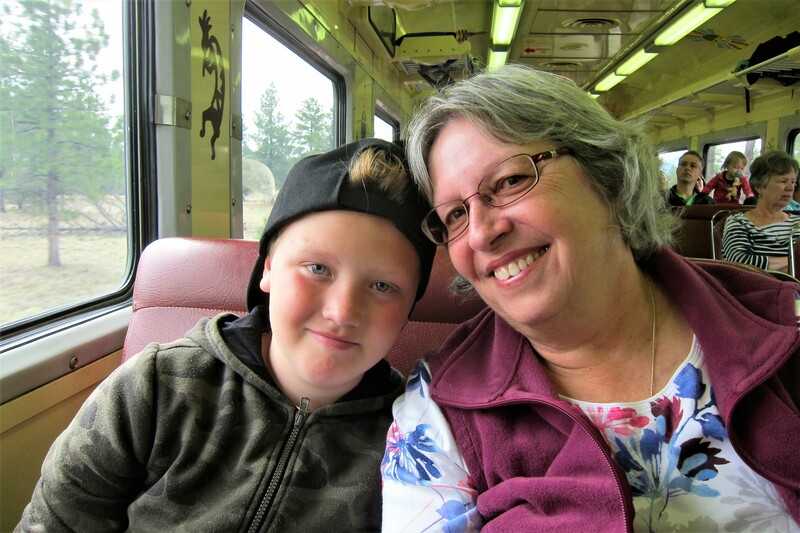 Saying our goodbyes and getting prolonged grandkid hugs, Kit and I headed back to the RV park for the evening. Tomorrow we continue east toward home…stay tuned! This entry was posted in 2017 Excellent Adventure, Uncategorized. Bookmark the permalink. It’s an addition of an edition, I don’t see the problem?? Looks like you guys had a great time with the grands, good for all. 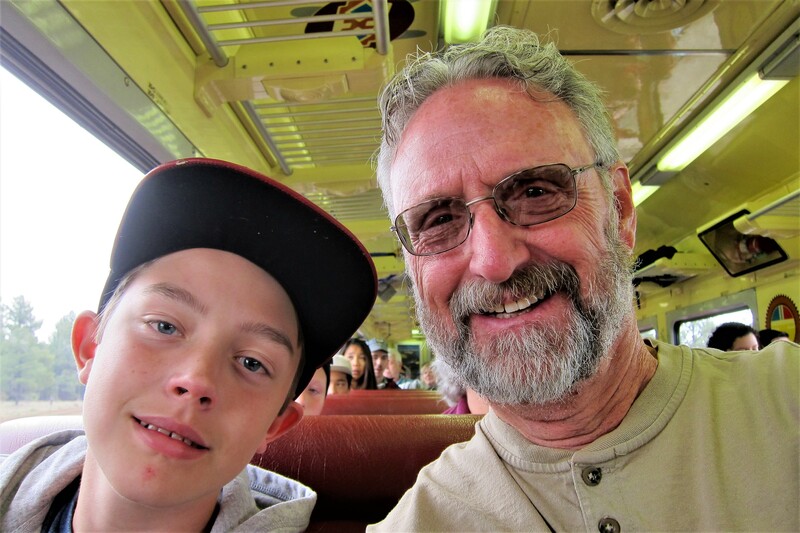 Did the Williams /Grand Canyon trip a few years ago with our Phoenix son…of course, when we arrived at the canyon, the fog was so thick we could see nothing. Still it’s a ‘been there, done that ‘ sort of thing! Thank you all for spending my birthday in such a wonderful way! Since we had to cancel our trip to Grand Canyon few years ago due to weather I thoroughly enjoyed hearing and seeing yours!. We are in Carlyle PA tonight in LaQuinta Inn. GoNna take 2 more days. Home on Wednesday. Absolutely LOVED this journal! 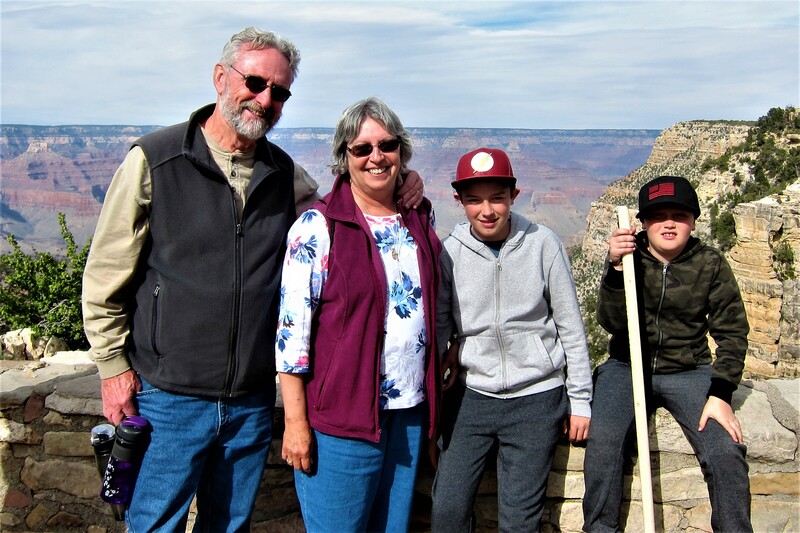 Having lived in AZ for a few years it was so nice to see Lake Mead, Williams, Flagstaff, and especially one of my favorite spots on earth…the Grand Canyon! Made me so homesick! Ft. Tuthill was very fascinating. What a great experience for the boys to be on this trip with the both of you. What wonderful memories for all of you! 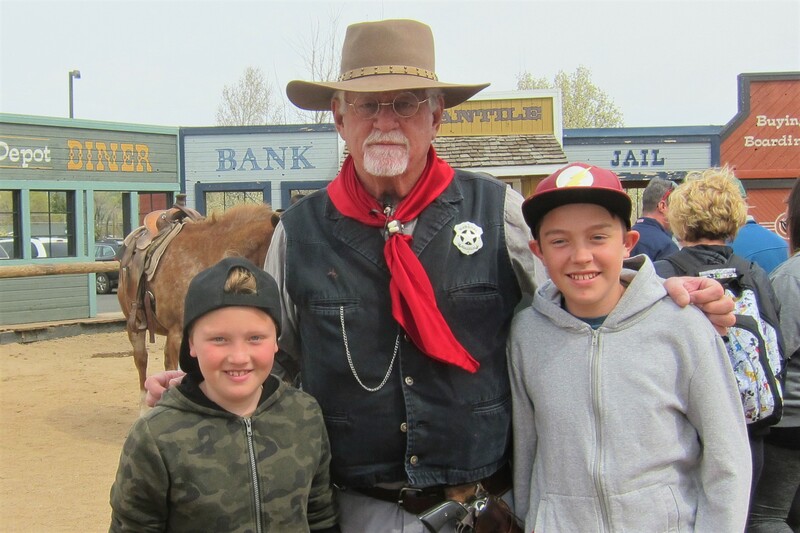 Wonderful trip with the grandsons! At our age, we’ve “seen it all.” As a grandmother of a 10 year old, I know how wonderful it is to see our world through new their eyes! Have conversations with them about the world around them, teaching and mentoring them is such fun! Our grandson recently looked at a Smart Car with disdain and said in a derogatory tone of voice, “WHO would buy THAT car?” We had the emissions control conversation re HE is doing the right thing, while WE are not. He thought about it and I heard from him a “Harumph!” noise so I know he got the message. It’s a very rewarding journey! WOW!! WHAT A GREAT MINI VACATION FOR THE GRANDSONS AND GRANDPARENTS. THE TRIP TO THE CANYON I SUSPECT WAS THE HIGHLIGHT OF THE VACATION. 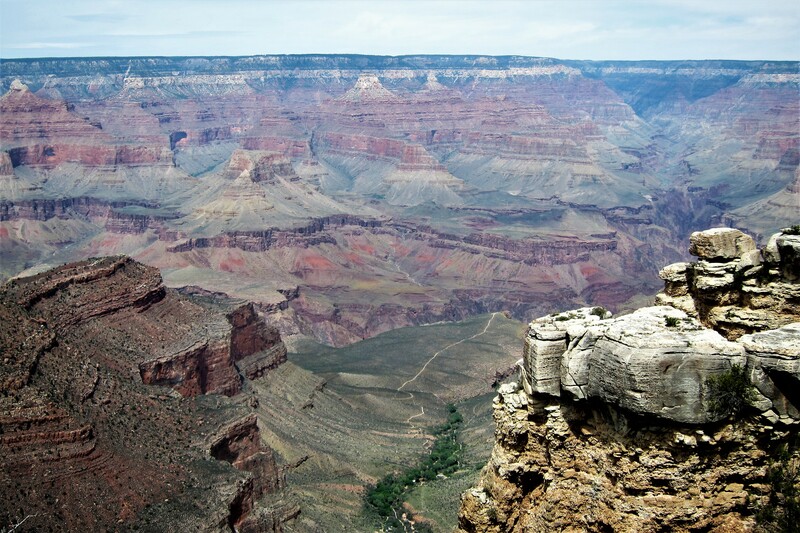 IN HINDSITE, I WISH JEANNE AND I HAD MADE A TRIP OUT WEST, ESPECIALLY TO SEE THE CANYON. I SUSPECT THAT THE BOYS WILL BE TALKING ABOUT THEIR GREAT ADVENTURE TO THEIR SCHOOL MATES. THANKS FOR THE RIDE!! 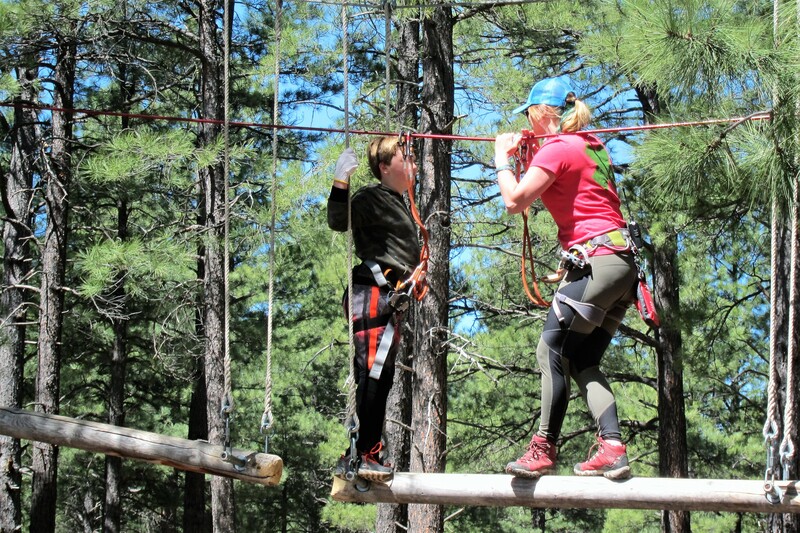 JEANNE WANTS TO TRY “THE SWINGING LOG BRIDGE” IF WE GO!! PS. I LOVE CROWS AND THAT WAS A GREAT ONCE IN A LIFE TIME SHOT BILLY! !